December 2015 I had new experiences in Naval Staff and Command School, Cipulir that I never imagined I would go there before. 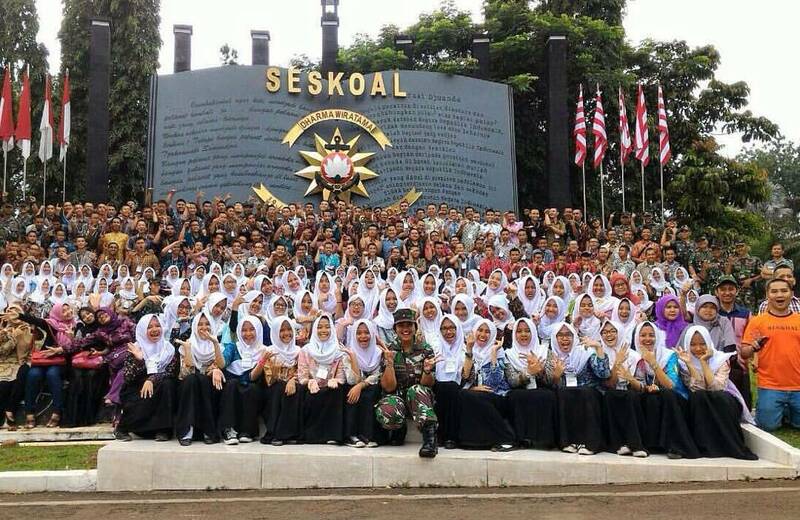 I went there in order to have a short English course and basic leadership training from my senior high school. All of the eleventh-grade students in my school went there. We stayed there for six days. We led by several members of the navy army there, they taught us a lot of new things. How to line up in the right way, discipline, independent, English course, and many others. They educated us very firmly, they hated our tears. When we made a mistake they would punish us, without any pity. We woke up at five in the morning and sleep at ten o’ clock at night every day, started from pray subuh, breakfast, did a ceremony, had English course, gymnastics training, and many others. Our roster there were very dense, we did not have enough time to rest. We were so shocked at the beginning they taught us like that, the same thing happened to me. But I still could do all of the activity until the second day. On the third day, I felt my body not well since I woke up in the morning. I thought maybe I just tired because of the training, so I ignored it and did my activity as usual. I could still do all of my activities there with my weak body. At night, there was an event from the naval officers. When the event started, I felt like the air was very cold. I asked my friend behind me did she feel the same way with me, but she said the air was very hot. It made me so confused, what happened with my body. When the event was over, I went straight to my room and laid in bed with my body shivered. My roommates who saw me panicked and they called the guardian officer immediately. Then, one of the guardian officers took me and brought me on the first floor near my teachers’ room. I only could cry and did nothing because I felt really bad. Afterward, many guardian officers and my teachers tried to make me calm but I could not. Until my religion teacher said that I was possessed by the watchman there, so she and many people there decided to do ruqyah or exorcism to me. Many male soldiers pressed and squeezed almost all parts of my body, I do not know why they did that to me. So I just screamed so loud “It hurts! Please stop do it!” but they ignored me, instead they said to me “Therefore you have to come out from this body!” I tried to say that I was not possessed by anything, I just sick but they ignored me again. Then my religion teacher said that there was a ghost child who possessed me, I still awake even I could not see. So, I was so shocked to hear that. I thought she was wrong because I could still felt in my body. Not long after, I saw a “child” passed in front of me but I thought he was not a human. It made me more felt unwell. After the ruqyah was done, the people around me still tried to make me calm but I could not. Plus I could not move my whole body, I think that because the male soldiers did to me before. You can imagine many male’s soldiers tried to press and squeezed all parts of the woman’s body with the maximum power. They said that my whole body was very stiff like a mannequin. They got panicked and brought me to the army hospital by an ambulance. In the hospital, they said that there were many bruises in most of all parts of my body. Thereafter they just realized that I was not possessed by something, but I just sick and even they made my condition was getting worse. The soldiers tried everything to make my body as before, but it always failed. On the other hand, I always cried and could not hold it because it was very hurt more than you can imagine. I just screamed “I want to go home” and I asked them to call my parents, but they said, “Stay calm, we can still handle you.” It was already two o’clock in the morning, they who were trying to heal me got tired and out of mind to find a way to cured me. The last way they brought me into a room, there was a machine and they said the machine was very hot and the function was for healing an army who got injured. So they put that on me, and I even could not feel the hot sensation until they set it to the maximum. Luckily, my condition was better than before even though I could not walk and they should carrying me to a wheelchair. It was very weird I went back to my dorm after that and my friends there looked at me who used a wheelchair. Because all of the events that happened to me, I got many privileges by the soldiers and my teachers there. When all of my friends walked to many training places, I precisely delivered by the guardian and they forbade me to walk. But I also felt sad because I could not do all of the activities in the field because of my condition. When I tried to do the ceremony, my feet could not be move and I had to be taken to the hospital again. Thereupon my teachers and the guardian always paid attention to me. Until I felt like I was really special there, like a diamond. Sometimes I thought about a “child” who I saw before when I got sick, was it real or it was just my imagination. But I ever heard from my teachers, they ever told to all of the students there to be more careful because there are many “things” who was there. There have been so many bad things that happened there because of “them” from someone lost until someone passed away with unknown reason. On the fifth day, we had training about medical things at night. Suddenly, my body could not move again and I could not breathe. Then, the guards brought me to the hospital again by ambulance. There was something that I think it was funny. A doctor came to me and wanted to heal me. He put an oxygen hose on my nose and he said to me “It is okay, you just get fever and stomach ulcers.” Then it made the guards who were beside me, and one of them said to the doctor “No! She got a bad incident three days ago and it makes her body cannot move until now. Just heal her hands and her legs with anything!” that made the doctor so shocked because he did not know anything about that and there was no any record about me at this hospital. They got difficulty to heal me because they had to give something behind my knees to reduce the pain, but at that time I wore skinny sports pants so they could not pull my pants until my knees. Soon after that, they succeeded to pull my pants and treated with spray medicine but I think they were tearing a little of my pants. At midnight when my body got better, they brought me to the dorm because I had to pack for went back home tomorrow. On the last day, we were ready to go back to school and I got special treatment again. When the others brought their own stuff, all of my stuff was brought by my teacher. Until finally we arrived at school and I just met my driver to pick me up, it made me could breathe freely. There was no ‘nightmare’ again like in there, and I just wanted to arrive at my home as soon as possible, then I wanted to lay in bed and sleep as much as I want. On the way I went home, I just thought it was an unexpected experience and my real ‘nightmare’ but if I did not experience it, maybe there was nothing special there and I could not remember it for a long time. Albeit that made me could not do my normal activity as usual for almost 2 months after that incident.